Description: Uppercross House Hotel has recently been restored to its former glory and an extra wing has been added to provide the modern comforts expected while preserving the elegance of yester-year. 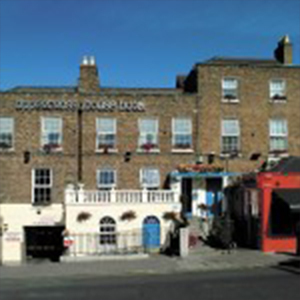 Uppercross House Hotel is located in one of Dublin's vibrant district of Rathmines, it is 2 miles from Dublin City centre. The hotel is surrounded with an array of good restaurants, cafe-bars, pubs, shops, cinema, fitness centres & swimming pools. The Hotel is a beautiful 3 star boutique hotel and close to many popular attractions, some nearby locations are: 3Arena, Croke Park Stadium , Convention Centre Dublin , Dublin Castle, St. Patrick's Cathedral and Guinness Storehouse and many more. Our award winning bar & restaurant Mother Reilly's, is one of favourite bar in the heart of the Dublin City suburbs in the town of Rathmines. The bar is renowned for its great atmosphere, food & drink and warm welcome. We are located only a short journey away from live consert venues: the 3 Arena, Bord Gais Energy Theatre, Gate Theatre, and Abbey theatre, also we offer live entertainments at our Mother Reilly's bar, come along and have a enjoyable evening. We at Mother Reilly's in Rathmines an award winning bar & restaurant offer an extensive a la carte menu with a wide variety of cuisines to suit all taste buds. We update the menus continually to offer you the best food. One of the great place to catch up with live sports events is our Mother's Reilly bar as large TV sreens are provided to enjoy your favourite sport whilst you are having your meal or drinks. Also we are an excellent choice if you are attending a sport event in Aviva Stadium or Croke Park. The Hotel is surrounded with vast array of local leisure options, numeros gym and fitness clubs are located just stone's throw away from us. Swan leisure Centre with a great fitness and swimming pool is a 3-minute walk from us. Please ask our reception for more information. Uppercross House Hotel offers a private function room which holds up to 50 people seated. The private function room caters for all types of events such as intimate weddings, christenings, communions, birthday parties, fundraisers, quiz nights and graduations. Our Hotel boasts 49 newly decorated en suite rooms, all the rooms have direct dial telephones, safes, Satellite TV and guest controlled heating.